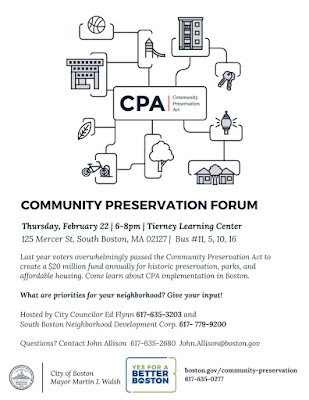 What: Come learn about the fund created by the Community Preservation Act. Share your neighborhood’s funding needs and your ideas. Format: Welcome/Introductory participant questions, Presentation with Q&A, Breakout Groups on Historic Preservation, Parks and Affordable Housing and Next Steps. In November of 2016, Boston residents went to the polls and voted to adapt the Community Preservation Act (CPA). The Conservation Preservation Act places a 1% surcharge on residential and commercial property taxes to fund affordable housing, parks and open space improvements (including outdoor recreation facilities) and historic preservation. CPA exempts the first $100,000 in assessed residential value, and low-income home owners and low- and moderate-income seniors. The City projected that CPA would bring in $16 million to $20 million annually to the Community Preservation Fund. The Community Preservation Committee (CPC) is responsible for recommending allocations of expenditures from the Community Preservation Fund. The Committee is composed of Mayor Walsh’s appointees: Chris Cook (Boston Conservation Commission), William Epperson (Parks and Recreation Commission), Felicia Jacques (Boston Landmarks Commission), Carol Downs (Boston Planning and Development Agency (BPDA) Board), and Kate Bennett (Boston Housing Authority), and four individual City Council appointees : Matthew Kiefer for a term of 1 year, Kannan Thiruvengadam for a term of 2 years, Madeligne Tena for a term of 3 years, and Ying Wang for a term of 3 years. Christine Poff serves as the Community Preservation Director. In December 2017, Boston City Council voted to approve Mayor Walsh's appropriations order for just over $285,000 for the administrative and operating expenses of the Community Preservation Committee (CPC) for FY 2018 (July 1, 2017 through June 30, 2018). The Council also voted to appropriate $17.9 million from the Community Preservation Fund annual revenues for further appropriation upon the recommendations of the Committee. 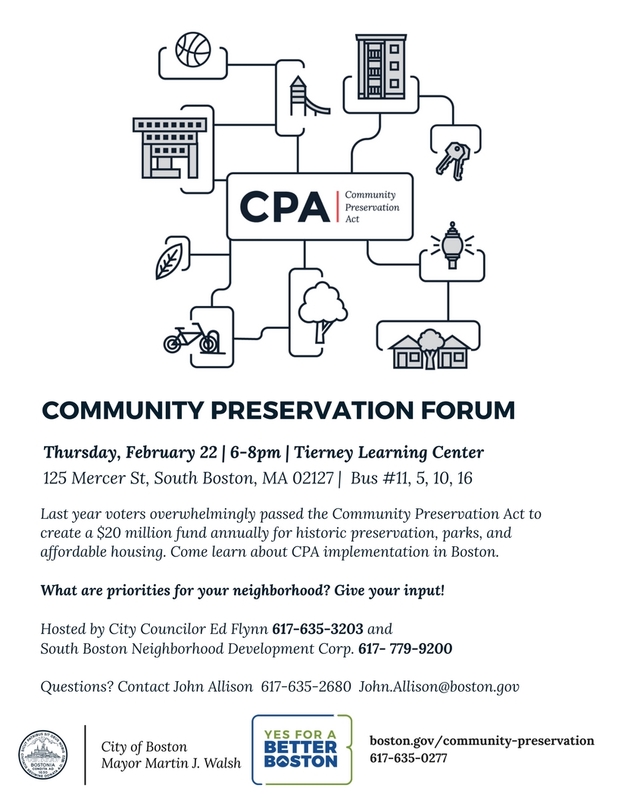 Bring your ideas and neighborhood needs for affordable housing, parks and open space improvements and historic preservation to the Community Preservation Forum on February 22nd.